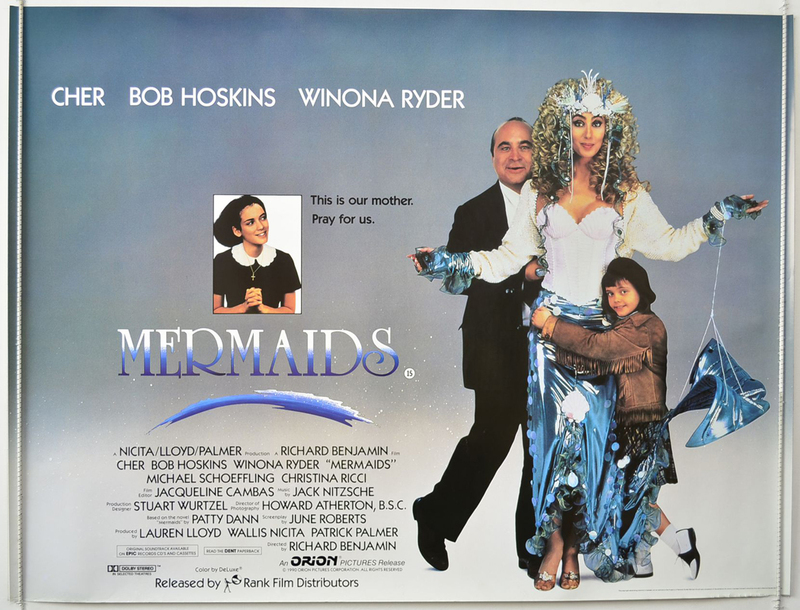 Review: Maybe not so much a hidden gem as an underappreciated one, Mermaids is a quirky comedy about an eccentric single mom nomadically raising her daughters in the early 1960’s. The film was a perfect fit for the talent involved…though there were several key players that weren’t originally signed on when the movie moved into production. First off, director Richard Benjamin was the third director of the movie after Lasse Hallström and Frank Oz both were ix-nayed by star Cher. Speaking of being replaced, blonde brit Emily Lloyd was supposed to play Ryder’s role until it became clear that Lloyd bore little resemblance to the woman supposed to be playing her mother. So Benjamin and Ryder stepped in and I can’t imagine the film any other way. For all the jokes and jibes Cher has received over the years, she’s a damn fine actress and hasn’t really turned in a performance that was an embarrassment. As Mrs. Flax, she’s relaxed and carefree…keeping the kind of home we’d probably like to visit if she was the mom of our best friend. A bit of a man-eater, she meets her match when she arrives in a small New England town and takes up with Hoskins’ lovable sh0e-salesman. The story is seen through the eyes of Charlotte (Ryder, Frankenweenie) as she struggles with her love of all things holy and a burgeoning attraction to a local caretaker (Schoeffling). Not wanting to turn out like her mother and feeling like she has to be a surrogate parent to her sister Kate (Ricci, in her first film), Charlotte takes several missteps that have ramifications both humorous and dramatic. Based on a novel, Mermaids has a fair share of laughs that go in tandem with some serious exchanges. Cher and Hoskins have an opposites attract chemistry that glows as does Ryder with the handsome Schoeffling who knows how to play conflicted with the best of ‘em. With Benjamin’s sensitive direction, a nice attention to the early 60’s time-period, and a greatest hits soundtrack, Mermaids is received swimmingly whether it’s your first or thirty first viewing.